One of the things I am learning about frugalizing my life is the definition for value depending on the item I want or need, amount of money or the time I need to take to do something. 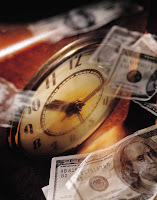 Below are a few ways to look at the value of time and money. Baby steps to the frugal, debt free life : "I decided to list the baby steps that dug us out of the crazy debt hole that we had buried ourselves in. When faced with the amount of debt and the prospect of having to give up much of one’s way of life, this all can be overwhelming to the point of wanting to just crawl under a rock and die." Why The Compact Is A Shrewd Investment : "When I tell people that I do The Compact, (buy nothing new) they seem to assume that I am filling my house with tons of second-hand junk. Nothing could be farther from the truth.It is because I do only buy used, that I can afford to fill my home with wonderful high-end antiques." Which clothing merchants really cater to customers? : "In the December issue of Consumer Reports, we ranked 39 major Internet clothing sellers, based on 25,565 reader judgments of value, quality, fit, selection, and ease of ordering. In looking over the list, I decided to compare the return policies of the Web merchants that readers said offered the best combination of quality and bang for their buck." Murrysville Woman Beats Wal-Mart In Court Over $2 Error : "Bach said she sued because she alerted management about the error but the price scan was not corrected on her subsequent visits to the store. Though the $100 award is relatively minor, Bach said it's not the money that's important to her."